If there remains any doubt that Donald J. Trump is the undisputed master not only of the Republican Party but of the conservative movement that is supposed to be the GOP’s conscience, this week’s annual CPAC conference — the preeminent right-wing political gathering of this and every year —should remove it. As Dave Weigel reports, the event is shaping up as a long celebration of the 45th president and of MAGA in all its dimensions. Both President Trump and Vice President Pence will deliver speeches at the three-day Conservative Political Action Conference, on Friday morning and Thursday morning respectively. A half-dozen members of the administration will give remarks or sit for interviews. Trump critics will be nowhere in sight. And he and his entourage will not have to share the limelight with mere congressional leaders, either; Mitch McConnell and Paul Ryan won’t be there. Indeed, aside from conservative warhorse Senator Ted Cruz (who has conspicuously reconciled with Trump since the unpleasantness in 2016), perhaps the most prominent speaker from the Hill is Representative Devin Nunes, that great Trumpian warrior against Robert Mueller and the FBI, who will give the conference’s closing address. [There’s] a prominent Thursday morning speaking slot — less than an hour after Pence — for Marion Maréchal-Le Pen, the youngest member of France’s far-right political dynasty. Former leader of UKIP and Trump adviser Nigel Farage will also be in the house. And there’s lots of room for an assortment of semi-reputable and disreputable full-time Trump shills, from Sean Hannity to Sheriff Dave Clarke to Sebastian Gorka to Michelle Malkin. 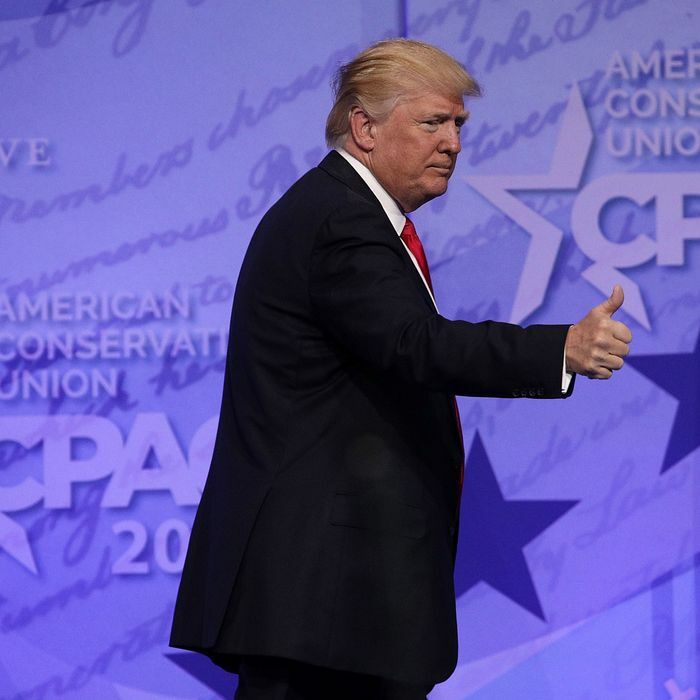 Hard to believe it’s only been two years since presidential candidate Trump abruptly canceled a CPAC appearance amid reports of a large walkout to protest his ideological heterodoxy. Now most former #NeverTrumpers have either chosen to bend the knee to their new chieftain, or devoted themselves to an anti-anti-Trump line that’s nearly indistinguishable from the true article. Whatever the political future holds for Republicans this November or Trump himself in 2020, conservatism currently lies at his feet. And given Trump’s well-known penchant for praise, we can expect CPAC to resound with hosannas for the president that will echo all the way to the White House and back.